A space to facilitate community-led collaborative thinking and idea-generation to effect policy changes via the Institute for Emerging Issues (IEI). IEI is a non-partisan public policy organization that exists to enhance North Carolina’s long-term prosperity. It connects North Carolinians across sectors, regions, and perspectives for collaborative work on key emerging issues affecting the state’s future economic competitiveness. In collaboration with Nida Abdullah and Brandy Luce. I was in charge of the table interface in the Thinkerspace ecosystem. I conceptualized, tested, and prototyped a software for this context. I was also instrumental in the systemic thinking behind designing the other parts of the ecosystem, and how the individual parts came together to become a seamless experience. In our proposed strategy to increase user engagement in the Emerging Issues Commons, we position the Commons space as a “Thinkerspace”, where individuals can create and build collaboratively — with each other as well as with IEI. The space restructures the Commons as a space for creating and building off of ideas while maintaining the momentum of past forums as well as looking towards the future. The Thinkerspace relies on engagement strategies that break down large complex issues such as community transportation into relatable and personable daily activities, such as going to class in the morning. By breaking down these complex yet important community issues into simpler questions, goals are more achievable and individuals are more motivated to provide firsthand feedback. These topics are investigated through phases in the space — exploration, implementation and use. In our proposal, we divide the physical layout of the Commons into three spaces — the Creation, Curation, and Orientation spaces. The Creation space focuses on content generation by visitors via analog or digital input; the Curation space shows information relevant to the current issue being addressed, curated by the IEI staff; the Orientation space serves as an archive that connects the previous fora to the current issue so the user can make connections to past issues. The Creation space acts as a hybrid space between physical and virtual environments. It blends physical objects with technology to allow the participants to customize, play, explore and create. The activity of writing on the whiteboard in response to prompts by IEI is visualized by lighting in the wall, encouraging conversation and collaboration through play. This visualization, though abstract, also indicates the presence of activity to people outside the space to encourage them to come in and participate. The whiteboards can be used to explore ideas and evaluate which are worth moving forward with and submitting from the wall's physical space to the table's interactive digital space. The table interface visualizes the networked connectivity of ideas with one another. It is also an entry point for picking up and building upon previous ideas. As IEI works through phases, ideas are submitted by participants which connect to a gradually forming spherical helix. When the first phase starts and there aren’t many ideas in the space, the shape formed by connecting the ideas is pretty vague and nondescript. As more ideas are added, the “idea space” starts taking a more concrete form, denoting a more concrete idea by the community about what should be done. This visualization direction was chosen to denote the raw, unfinished nature of the data in question (ideas submitted by participants), as well as the gradual building upon ideas from previous phases by positioning them in a helical structure. Ideas can be added from the white board by tagging the written ideas, as well as through entering them on-screen. From afar the shape is pretty abstract and the ideas’ text content can not be seen. 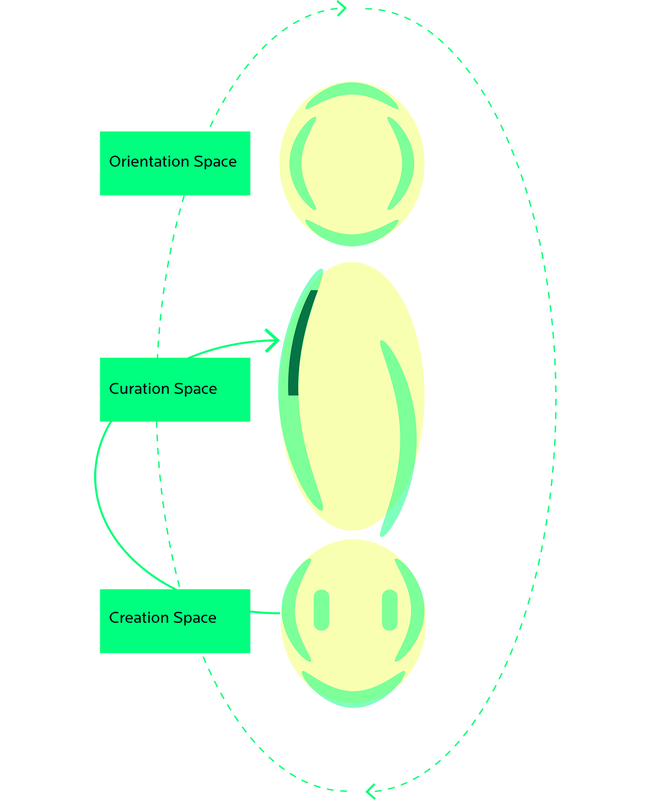 This stage acts as a reference point for how many ideas have been added — the more the shape looks like a sphere the more ideas have been added. To read the ideas themselves and to contribute, the user has to zoom inside the sphere and look at the ideaspace from the inside to get an "insider's look" at the idea space. Ideas would ideally be “categorized” by either the staff or stakeholders, but users have the agency to move ideas around to change connections as well. The animated GIFs here show some of the interactions designed and developed for this interface using Processing. The Creation space displays prompts in the form of short questions that IEI asks to its patrons. The participant can choose to respond to the prompts by writing on the whiteboard, building upon previous ideas already on the board. This triggers a feedback from the light installations in the walls, to instill a feeling of play to keep the participants engaged as well as draw people in from the outside. When ideas are generated on the whiteboard, these ideas would be archived into the table library. The user would be able to pinch in and out through a touch interface, and drag from side to side to navigate the information abstraction. Ideas are sorted into a category based on the phase, such as exploration, implementation, or use. To explore these ideas further, the user can zoom inside the structure, whence he / she can get an "insider's look" on the ideas submitted, and explore what people are saying and how they are connected. Here, the color coded handler in the center orients the user. Along with orienting the user via color changes, the handler also acts as a selection tool in this "insider" space, highlighting the idea node that is currently selected while greying out the others. The handler can be tapped to add an idea to build upon previous ideas. The user can also drag ideas around to restructure the connections. This enables IEI staff members to steer the conversation in a direction which would be the most effective for conversations with policy makers.